Nermina Alic, poses for a photo with the Olympic flame torch that she designed for the upcoming European Youth Olympic Winter Festival in Sarajevo, Bosnia-Herzegovina, Feb. 4, 2019. Nermina Alic learned her trade as a coppersmith by watching her father as a child. Now she is hoping her skills - and a battle against prejudice - can help keep the dying art alive. 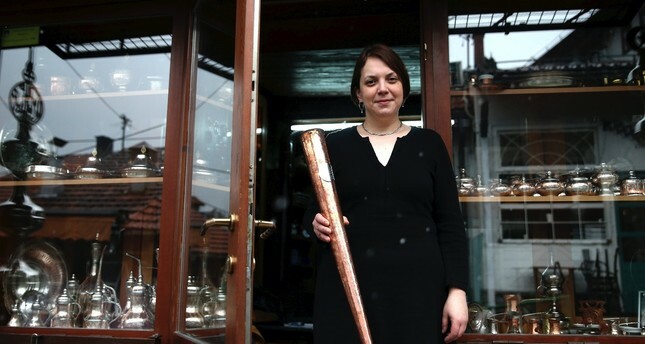 She was recommended for the prestigious commission by one of the male craftsmen she works alongside in Sarajevo's Old Town, where coppersmiths have crafted Turkish-style coffee-pots and traditional round baking trays for the past 500 years. "I was definitely honored and happy to work on such unique and unusual project," Alic said. "It is extremely good and positive for this city to have again Olympic spirit and Olympic flame." "It was so natural for me to be working here," said Alic, an only child who inherited her father's business. "Much before I have realized there was division on male and female jobs, I had understood that copper is material that I understand, love and function well working with." "Most customers coming to the shop look for a male and never address me," she said, while a muezzin prayer could be heard from a nearby mosque in the still largely patriarchal society. "But when they recognize they can do business with me, they don't care if I am male or female. When you are good at what you do, all barriers disappear."